I was writing a post about the importance of including images in posts with embedded video’s recently and discovered a great little “hack” to hide said images so that only the thumbnail would show up when shared. This post is the result of that discovery, it solved a long standing issue that I had with video only posts. 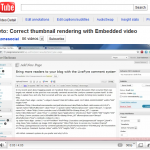 If you also had come across this issue the video tutorial in particular will be very valuable. There is actually a hidden image immediately after this paragraph, view the page source if you want to see it or watch the video to see how it was done. In the example above the image represents the 2 Year Anniversary of Waxing Unlyrical (Shonali – that’s 3 days in a row, inside joke sorry readers). With the two candles you really get the gist of what the post is about before reading it, the image ties in perfectly with the title and what the post is about. The example above is clean and professional. Have you tried Tagxedo? It’s a pretty nifty little app I spotted on @liendi11’s Amplog recently. While playing around with it I realized that it was more difficult to get the clouds to work in WordPress than one would think so when I found a way to get it to work I also created a video to explain it. The method that I demonstrate shows you how to create a tagxedo cloud that is usable in both pages, posts and even as a widget. The main thing that needs to be modified is the size of the iframe code that is provided in the tagxedo code snippet. Here is the video followed by a live example of the tag cloud. I can Fix Anything, let me do it. I am glad that my son is confident in his abilities and wise enough to know he does have limitations. Being his dad is absolutely the best thing I have had the opportunity to do. Like many other parenting experiences, I also felt inspired to do more than write a blog article about this. I felt inspired to continue to do something that I pledged to do long ago. Someone at some point in my past stressed to me the importance that we empower children with the confidence to believe that they can achieve anything they set their minds and hearts to accomplish. I wish I could remember who it was, but that call to action stuck with me. Please join me in an effort to encourage young people to believe in themselves. Start today! I was recently going through my photos and noticed I had some diverse wild-life shots. All these photos were taken in front of or behind my home. Some of the pictures are not very high detail because they are taken hastily from a distance, through windows, etc. I spotted this tonight on Amplify.com the source referenced was DMI Denmark. This is an animation of the volcanic ash cloud that has disrupted flights and wreaked havoc.